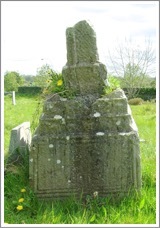 The crosses of County Tipperary include: Ahenny North, Ahenny South, Ardane Large cross head, Ardane Small cross head, Ballynilard, Cashel St. Patrick’s, Emly, Lorrha North, Lorrha South, Mona Incha, Roscrea, Roscrea Pillar and Toureen Peakaun. The location of County Sligo is indicated by the red star on the map to the right. What do we know about the monastery that was located at Ahenny? After considerable research on line and in the books available in my library, I concluded that Halpin and Newman sum it up perfectly when they write “nothing is known of its history -- probably because the original name of the site has been lost and replaced by a later dedication to St Crispin.” (Halpin, Newman, 434) As nothing is known of the history of the monastery, so too, nothing is known of an Irish saint named Crispin. 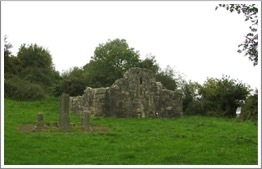 The ancient Monastic site of Kilclispen [lies] in a small fertile valley running north into the Slievenamon hills.” (Meehan, p. 496) A short distance to the east is the river Linguan that separated Ossary from Munster in ancient times and separates County Tipperary from County Kilkenny at the present time. The photo below shows the cemetery. The view is to the east. The supposition is that a monastery flourished here, founded between the 5th and 7th centuries. 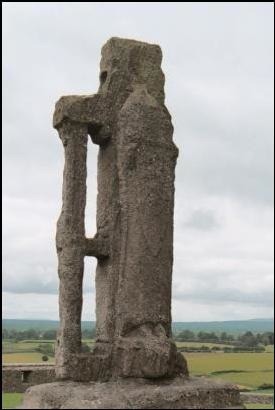 (www.megalithic.co.uk) That the monastery flourished is testified to by the presence of two High Crosses and the base of another. Whether founded in the 5th, 6th or 7th century, it was thriving during the 8th century, when it is supposed the crosses were carved. 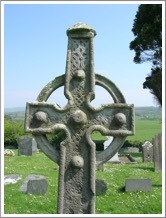 They have been identified as among the earliest of the Irish High Crosses. The original name of the site is not known, but at some point in history, the site was given the name Kilclispeen, St. Crispin’s Church. The ruins of a late medieval church are located on the site. 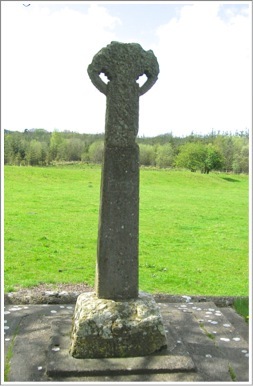 The Ahenny North Cross is located in a rural church yard in Co. Tipperary. 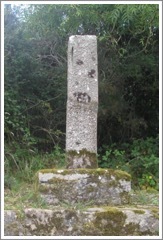 It is one of two crosses found there. 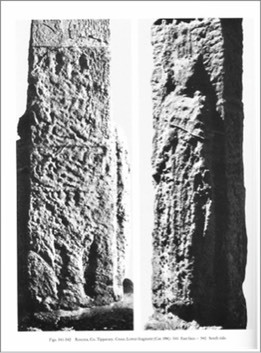 The photos show, on the left the west face of the cross and on the right the east face. The cross stands about eight feet in height. 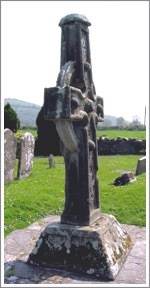 Both the North and South crosses are carved of sandstone and probably date from the ninth century, an early period of stone cross making in Ireland. 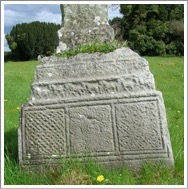 The cap of the Ahenny North Cross has been interpreted in a number of ways. Porter suggests it is an imitation of the miter of a bishop. Hilary Richardson sees it as connected with the dome shaped church of the Holy Sepulcher in Jerusalem. Helen Roe wonders if it was an original part of the cross or a later addition. As noted above, Edwards offers reasons to believe the caps were original. Moving down the shaft of the cross we find a zoomorphic design. Moving out from the center where there are four tightly woven coils, we have in each corner of the panel a spiral design that terminates in its center in three birds’ heads. At the bottom of the shaft of the cross we have two panels. The upper of the two is composed of a pattern of squares-in-squares. The panel itself is square and there are nine large and many smaller ones within. L-shaped corners surround the nine large squares. 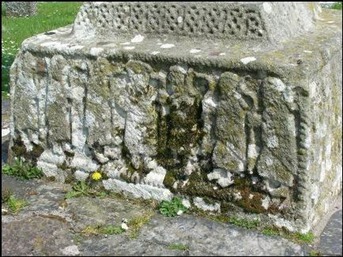 The lower of the two panels is on what is known as the plinth of the cross. In this space we have three interconnected spirals framed by rope-moulding. The head of the west face is quite complicated. “The head is covered like a spider’s web with a single panel of intricately-composed coiled spirals (some terminating in three animal heads), C-shaped scrolls back to back and S-spirals. 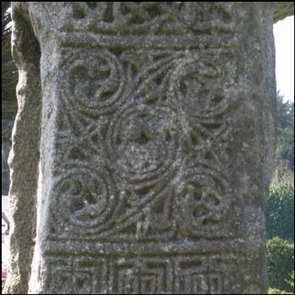 A boss in the centre of the head has interlace on the side and, on top, four curious raised features radiating from the centre which Clavert suggested to be an equal-armed cross. The boss on the shaft beneath it is flat-topped and has interlace decoration. The other bosses — on the arms and on the upper limb — are dome-shaped and bear interlace ornament, arranged in such a way so as to leave a sunken cross-form in the centre.” (Harbison 1992, 13) In this way the theme of crosses within the cross emphasizes the importance of the symbol. Moving down the cross we have an example of human interlace. There are four human figures, a head in each corner of the panel. The arms and legs are interlaced in a completely unnatural way. What does this mean? Does it represent the interconnectedness of human community, or perhaps the tangle of human sin for which the cross is God’s response? 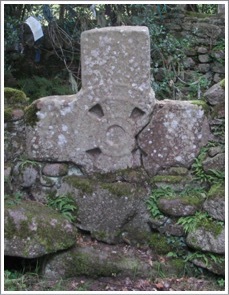 The base of the cross is carved on each side. The photo to the left shows the west face of the base. While interpretations of the scene vary, most scholars see the figure in the center as Christ and the flanking figures as Apostles. Many have suggested this scene may depict the story of the mission of the twelve told in Mark 6:6-13. 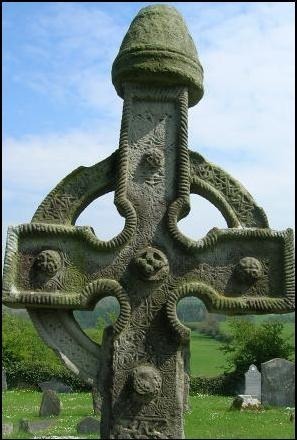 Cross: The shaft of the cross contains three panels, each with C-shaped spirals and a fret pattern and interlace. See the photo to the right. Ring: The ring contains a meander pattern and interlace.Upper Shaft: The upper shaft has three panels decorated with interlace. See the photo to the left. Arm end: The end of the arm has a central square that contains five interlinking spirals. See the photo to the right. 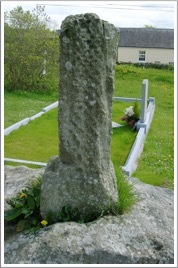 There West Face of the cross can be seen in the photo to the right. Base: In its present condition nothing can be easily discerned on the west base, seen in the photo below. 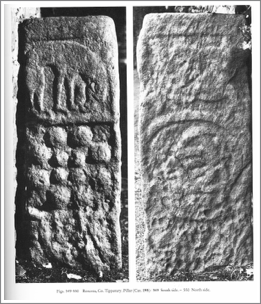 Earlier examinations revealed a hunt scene in each of the two panels (left and right). 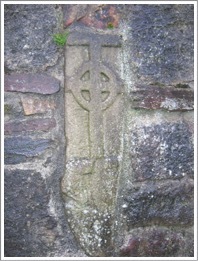 Cross: The rope-type moulding is a prominent feature of the cross, clearly seen in the photos left and right. The Shaft contains a pattern of “concave interlinked coiled spirals with expanding centres.” (Harbison, 1992, p. 14) See the photo below left. The Head has “two-strand interlace terminating in animal-heads which try to devour the bosses.” (Harbison, 1992, p. 14) See the photo to the right. There are five bosses. The center one is flat topped while the others are conical. 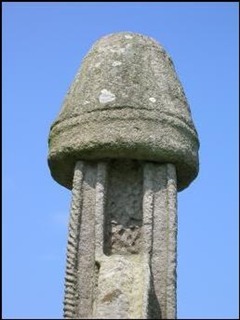 Cross: The design on the shaft and ring is similar to that on the south side. 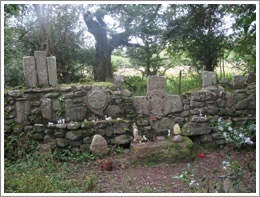 The site at Ardane contains a holy well and a disused graveyard known as St. Berrihert’s Kyle. The photo to the left below appears in 1909 in a paper by Henry Crawford and Steward Macalister. 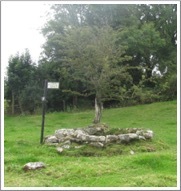 (Crawford and Macalister, facing p. 59) The site has obviously been improved over the years as indicated by the photo on the right. It now consists of a stone wall that circles the area and is lined with various crosses and cross slabs. 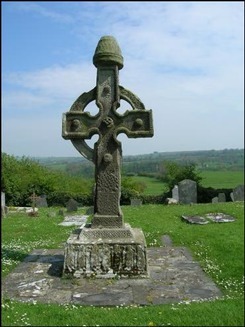 There are two cross heads of free standing crosses. 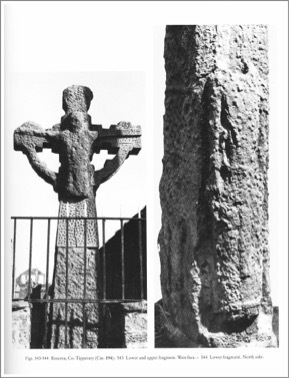 The photo to the right offers sketches by Crawford of the two high cross heads. (Crawford and Macalister, p. 60) The larger head has a six pointed star in the center. Harbison refers to this design as a marigold pattern. Around this are two circles with design. The inner contains interlace knots, the outer a slmple fret pattern. 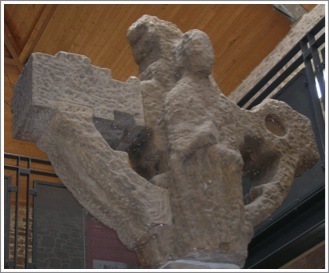 On the top of the cross are three figures, the outer two holding up the arms of the inner figure. The north or left arm of the cross, not shown in the illustration contains an image that Harbison identifies as the Kiss of Judas. The south arm, pictured in the illustration is tentatively identified as the Mocking or Flagellation of Christ. On the top arm the image may respresent the Second Mocking of Christ. (Harbison, 1992, p. 19) This would mean that the figural images on the head all have to do with the passion of Christ. It might be reasonable to assume the images on the lost shaft also had images from the passion. 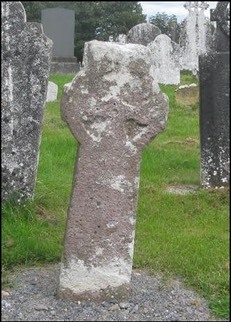 The other face of the larger cross is also visible. It has a cross in the center of the head that is surrounded by a circle. 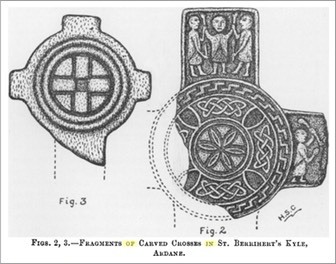 Harbison identified interlace on the ring and the arms. (Harbison, 1992, p. 19) See the photo to the left. The smaller of the two cross heads contains a Greek Cross with a square depression at the center. It is surrounded by two raised circular mouldings. The back side of this cross is not visible. See the photo to the right. Getting There: This site is not signposted and can be challenging to locate. It lies south of the L3102 west of the N24. The best strategy is to ask locals once you are in the vicinity. We were fortunate enough to meet the owner of the land, who gave us directions. Nothing is known of the history of this site. In 1899, A. P. Morgan published a small article in The Journal of the royal Society of Antiquaries of Ireland. He noted that near the cross were a socket-stone and a bullaun stone. There was no record of a burial place there and no trace of any buildings. The photos of the cross both left and right come from Harbison, 1992, Vol. 2, Figs. 61 and 62. 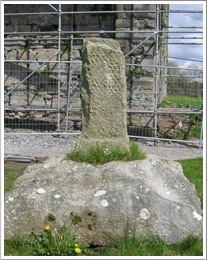 In 1101 CE, during a synod held at Cashel, Muirchertach Ua Brian, King at Cashel, gave the rock and surrounding land to the Church in honor of God and Saint Patrick. 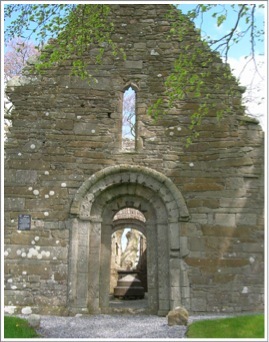 At the Synod of Rathbreasail in 1111, the largely monastic organization of the church in Ireland was replaced by the Episcopal system and Cashel became one of two Archdioceses in Ireland, the other being at Armagh in the north. The buildings that now top the Rock of Cashel are from the period of church control. They include the ruins of a cathedral, a chapel, a round tower, and the hall and dormitory of Vicars Choral. 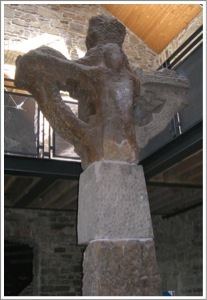 The Cross of St. Patrick stood near the cathedral and was almost certainly carved in the early 12th century. The original is now indoors and a replica stands in the place the cross originally occupied. 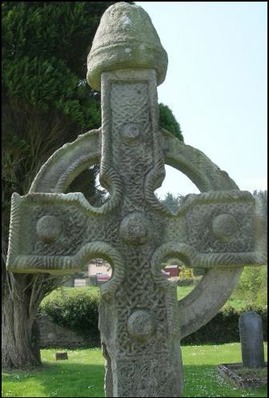 By making copies and moving the original inside a number of the Irish High Crosses are being preserved for the future. 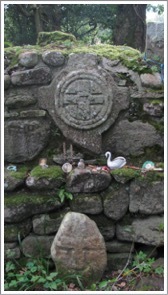 The Base: The cross of St. Patrick stands on a large stone base not seen in full in these photos. The interesting thing about this base is that legend has it that this stone was used in the crowning of the Kings of Cashel from pre-historic times to the twelfth century. West Face [right]: Francoise Henry describes the west face. “A very monumental figure of Christ dressed in a long, plain dress reaching to the feet, occupies one side. As H. G. Leask has shown, there may have been small angels carved on separate stones, on both sides of the head of Christ.” (Henry 33) Peter Harbison adds that “on his breast Christ would seem to bear an upright rectangular object (satchel or reliquary?) suspended from around his neck, while beneath the throat there would appear to be a horizontal lozenge-shape, perhaps a brooch.” (Harbison 35) These objects are not readily visible when viewing the cross. If the object is a satchel, it would very likely have been understood to contain the Gospels. 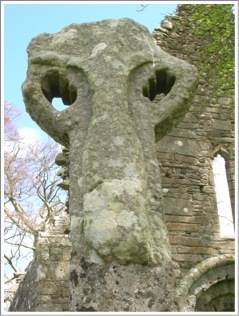 Unique Features: The Cashel cross is unique in that it had vertical stays reaching from the base to the end of each cross arm. Roger Stalley suggests these were structural. (Stalley 44) Françoise Henry suggests these props may represent the crosses of the thieves crucified along side Jesus. 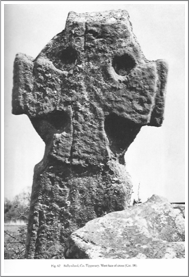 (Henry 33) In addition, the Cashel cross, like others from various periods of cross carving does not have a circle around the head. From the Emly Parish Homepage referenced below we find this brief history of the monastery there. St. Ailbe is Patron Saint of the Archdiocese of Cashel and Emly. Tradition tells us that he preached Christianity in Munster before the arrival of St. Patrick. He is also associated with the founding of a monastery at Emly. In their book ‘The Parish of Emly’ Michael and Liam O’Dwyer write, ‘Despite the complete obliteration of the layout of the original site we may presume that the monastic enclosure coincided with the present graveyard. 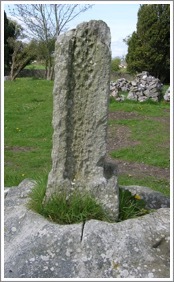 The presence of a well and an inscribed cross, both traditionally associated with St. Ailbe, and the fact that successive cathedrals occupied the area near the middle of the graveyard, are sufficient evidence for this assumption.’"
The Saint: Both Ailbe and Emly (Imleach lubhair) take their names from the pre-Christian history of the area. Imleach lubhair can be translated “the lakeside of the yew tree”, and there was apparently a sacred yew at this place. Ailbe was the name of a mythical divine warhound that guarded the boundaries of Leinster. The name Ailbe means “living rock”. Tradition states that Ailbe was abandoned as an infant and was found and raised by a she-wolf. From the Annals of Ireland we can identify a number of the abbots of Emly. They include: Conamail (d. 708); Celiac (d. 720); Abner (d. 760); Flann (d. 825); Eogan (d. 890); Mescal (d. 899); Flann (d. 904); Tipraite (d. 913); Eochu (elected in 914); Mac Lenna (d. 935); Eochaid (d. 942); Uarach (d. 954); Faelan (d. 980); Tipaite (removed 980); Cetfaid (elected 980); Marcan (elected 990); and Colum Ua Laigenain (elected 995). The Cross: The cross is ringed and imperforate. It stands just under 5 feet in height. The arms are short, reaching just beyond the ring. On each face a cross is carved. The Site: According to a brief history of Lorrha, a monastery was founded there in the middle of the 6th century by St. Brendan the Navigator. 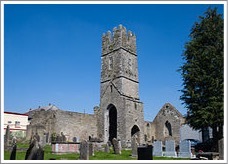 It was soon turned over to St. Ruadhan and Brendan moved west to found the monastery at Clonfert in Co. Galway. There is still some evidence of the ditch or mound that surrounded the monastic settlement. At the site today are the ruins of an 11th century church and the bases and shafts of two high crosses. 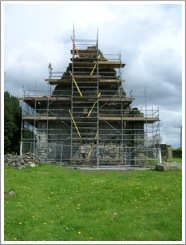 To the left is a photo of the old church building undergoing restoration in 2008. One of the crosses is visible just to the right of the building. 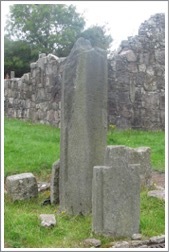 St. Ruadhan was considered to be one of the Twelve Apostles of Ireland. These were twelve saints who studied under St. Finian at the Clonard Abbey in County Meath. His name means “red-haired man”. He is considered the founder of Lorrha, founding it about 550 CE. He reportedly died in about 584 CE. 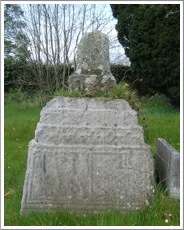 Ruadhan was a member of the royal Eoghanacht clan of Munster. As noted above he was educated by Saint Finian at Clonard, a very famous center of learning. In the hagiography, he is credited with many miracles. The most significant story about Ruadhan has to do with a conflict with the high king, Diarmaid mac Cearrbheoil. The king seized a hostage from Ruadhan’s sanctuary. As a result Ruadhan cursed him. The two were later reconciled and the hostage was returned in exchange for thirty grey horses. A missal is a liturgical book containing all instructions and texts necessary for the celebration of Mass throughout the year. A sacramentary contains only the priests part of services and includes such words for more than just the mass. Lorrha appears only a few times in the Annals of Inisfallen. 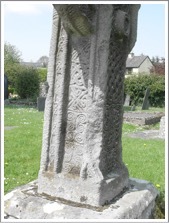 AI707.2 Colmán, abbot of Lothra, rested. •	AI747a.1 Kl. Repose of Dúngal, abbot of Lothra. The slaying of Aed Dub. •	AI780.1 Kl. Repose of Ailill, abbot of Lothra. •	AI809.1 Kl. Coibdenach the learned, abbot of Lothra, [rested]. Only a small portion of the shaft of this cross remains. The base is quite large, standing about three feet in height. East Base: The base is divided horizontally into two registers. The lower register has two parts. The left side of the register takes up about three quarters of the width of the base. It consists of two lion-like animals facing each other, each with a raised paw. Further right is another lion-like animal facing right toward a man with outstretched hand. The meaning is not clear. Noah summoning the animals into the Ark and Daniel in the Lions’ Den have been suggested. 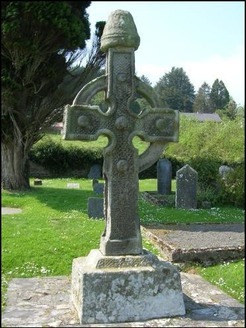 On the far right of the lower register Harbison identified two crosses, each with a hole in the square at the crossing. (Harbison, 1992, p. 137 and photo Vol. 2, Fig. 457) In my photo much of the lower portion of the base has been obscured by a grave marker (photo above right). The upper register of the base consists of several panels of fretwork. Above that is a narrow step that has a procession of animals moving from the right to the left. On the steps above that no decoration can be discerned. Base: The lower part of the shaft is divided vertically into two panels. The left panel has a scene carved on it. Harbison identifies what looks like an altar with faggots on it in the lower right corner. On the left side there is an indication of a tree. The panel could represent both Adam and Eve in the garden and the Sacrifice of Isaac. The right panel contains interlace. Above, on a narrow step there are animals moving from right to left. This repeats the pattern on the east face. No carving is visible on the upper steps. The Base: The lowest step of the base is divided into three panels. 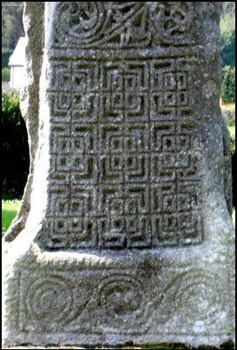 On the left is interlace, in the center a spiral decoration and on the right a panel of fretwork. The next step up has a procession of animals. The upper steps have no visible decoration. North Base: The lowest step is divided vertically into two panels. A bit of fretwork is visible on the extreme right of the right panel. Otherwise the panels are badly worn. On the next two steps up is a procession of animals. The base of this cross is about four feet square and about a foot and a half in height. It is rough-hewn in its present condition. Harbison noted that on the north side of the base there is possible Daniel in the Lions’ Den image. The upper part of this image has been broken away. Information on the history of Mona Incha can be difficult to unravel. The best source seems to be the research in the late 19th century by Canon O’Hanlon. He produced Lives of the Irish Saints. The photo to the left shows the entire area of the Mona Incha site. It is a very small area. It was originally an island in a shallow lake. O’Hanlon's research revealed the following. In the late 6th or early 7th century Saint Cronan, founder of the monastery at Roscrea, to the west of Mona Incha, built a cell on the island. Presumably he used this as a place of retreat. The Roscrea monastery was established in the late 6th century, placing the early religious use of Mona Incha to that same period of time. 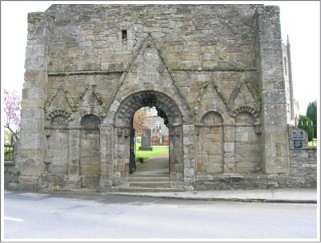 The photo to the right shows the west front of the church at Mona Incha with the Romanesque arch. One legend connected to the site states that any woman attempting to visit the island would die instantly. In contrast any man, while on the island, could not die. The photo to the left shows the east side of the cross. The east face of the head, as seen above, bears animal interlace but it is badly worn. The west face, seen in the photo to the right, bears an image of Christ crucified. We have the following description of the town of Roscrea, published in the Dublin Penny Journal in 1834, and signed with a simple “B”. This description could virtually be used as a tour guide of significant sites in Roscrea in the early twenty-first century. The photos below show some of these sites. 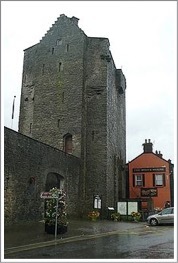 Clockwise from the upper left: Roscrea Round Tower, West Gable of the 12th century Romanesque church (photos by author), Gate Tower of Roscrea Castle and ruins of the Franciscan Friary. (wikipedia.org/wiki/Roscrea). 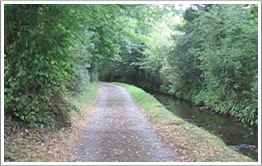 Roscrea is located in a gap in the hills along the ancient road known as the Slighe Dala. 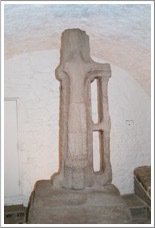 The cross is carved of sandstone and is in two sections, joined by a concrete piece that forms the upper shaft. It stands on a low base that has no carving. Shaft: The east face has four panels. The lowest depicts Adam and Eve, apparently clothed and standing by a tree. The next two panels up are badly eroded, and somewhat difficult to distinguish, but seem to have animal interlace. The fourth panel, also difficult to define, has a figure that may be a centaur. There are two figures behind. One of them may be playing a Pan pipe. Head: The majority of the south side of the head is a substitute. 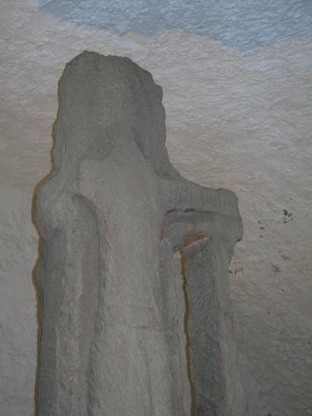 At the very top of the head of the shaft, part of the original, there appear to be two human figures. 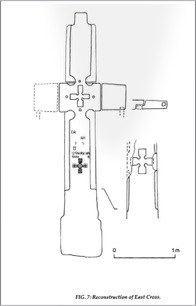 Shaft: The shaft on this face of the cross is badly worn. It has been identified in the past as having several panels of animal interlace. The photo at the left shows the upper shaft and the head of the west face. Shaft: There is a large human figure, wearing a long robe that is belted at the waist. The belt-ends can be seen hanging down the front of the figure. The head is missing and was apparently originally separate. A pillar, just under three feet in height, stands near the Catholic Church. It’s provinance is unknown. It was moved to its present site in 1938. 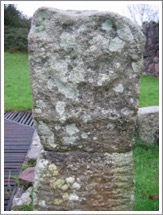 It is possible that it was originally part of a cross. North Side: At the bottom of the shaft is what appears to be a hunting scene. Above it is what appears to be "an animal interlace enclosed by a raised circular moulding.” (Harbison, 1992, p. 164) Above that is a quadruped that may be a winged griffin. See the image on the right in the photo above on the left. 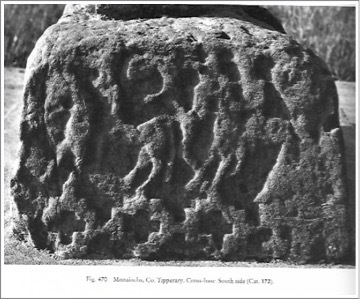 South Side: “A figure on the left may ride on a quadruped, and there may be a figure behind a (?) tree and two further figures in front.” Harbison notes that this might represent the Entry of Christ into Jerusalem. (Harbison, 1992, p. 164) Above this is a pattern of bosses. There are four bosses in the center surrounded by a ring of larger bosses. At the top of the chaft is a quadruped with an arched body. See the image on the left in the photo above to the left. The monastery that became Toureen Peakaun was founded in the seventh century by St. Alban or Abhun. 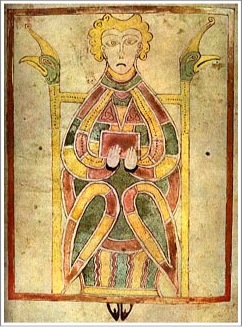 His successor was St. Beccan (also referred to as Peakaun, Beagan and Mo-Bhec-oc). It was from this St. Beccan that the name of the site derives. There is a scarcity of information about the history of the site. The features of Toureen Peakaun lie on either side of the small stream in the photo to the left. The road is just wide enough for one vehicle. A beginning date in the 7th century is suggested by the tradition regarding the foundation of the monastery. 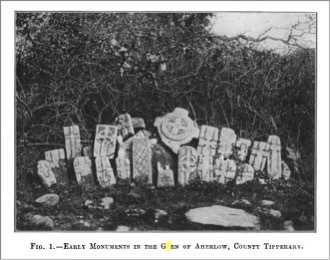 Harbison suggests that the inscription on the East Cross, which bears letters similar to those used on the Armagh chalice may date to the eighth or “at latest to the first half of the ninth century.” (Harbison, 1992, p. 379) The presence of a twelfth century church at the site suggests a continuation of the monastery during that time. 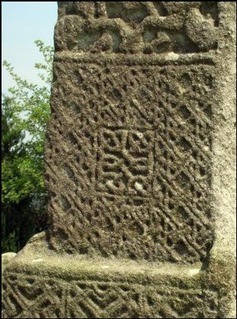 The presence of the West cross, a cross that is not early and seems to postdate the twelfth century, suggests the monastery was still active in the thirteenth century. We can deduce then that the monastery was active during a period of at least six hundred years, from some time in the seventh century till some time in the thirteenth century. The photo below shows the church with remains of the East Cross in the rectangular area in the left foreground. The primary information available regarding St. Alban relates to his foundation of the monastery at Toureen Peakaun. 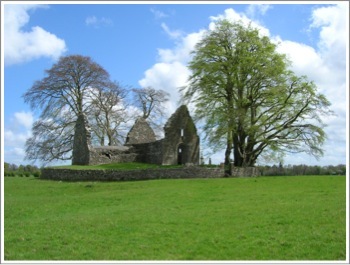 Canon O’Hanlon states that Alban established a “great and most regular monastery” known as Cluain-aird-Mobhegoc or Mobecoc. Tradition suggests that at some point after founding the monastery he moved on and left the monastery in the care of St. Becan. In a helpful article on her omniumsanctorumhiberniae blog, Marcella helps clarify who Saint Becan of Toureen Peakaun was. In the literature on the Irish saints there are three Becans whose lives seem to be confused and conflated. One of these saints is connected with Saint Alban; another with St. Colum-Cille and the third with King Diarmaid. 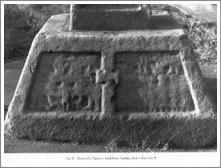 (http://omniumsanctorumhiberniae.blogspot.com/search/label/Saints%20of%20Tipperary) Making use of Canon O’Hanlon’s Lives of the Irish Saints, Marcella’s blog offers the following bits of information about this second abbot of Toureen Peakaun. O’Hanlon dates the life of Becan to the sixth century, believing he was a contemporary of Colum-Cille and King Diarmaid. 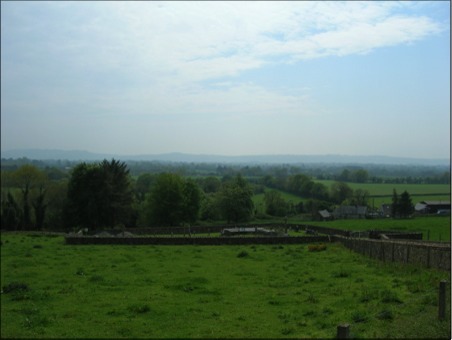 This would contradict the tradition stated above that the Toureen Peakaun monastery was not founded until the seventh century. In O’Hanlon’s entry, however, it is often difficult to determine which of the three Becans listed above he is referring to. He later refers to a death date for Becan of 687 C.E./A.D. This would be consistent with a seventh century date for the foundation of the monastery. 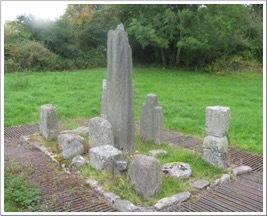 There are numerous features at the Toureen Peakaun site. The most obvious is the twelfth century church pictured above. The church is about 36 feet by 24 feet. 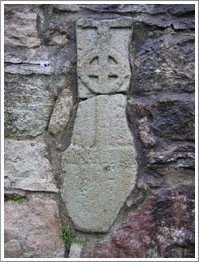 Fastened to the walls of the church are two undecorated stone crosses and the remains of a sundial. See the photos below. In addition, there are two cross inscribed slabs attached to the walls of the church. These are pictured below. 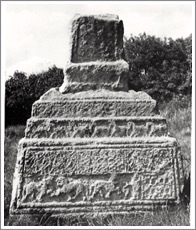 The source of these photographs is the Early Christian Ireland website cited below. 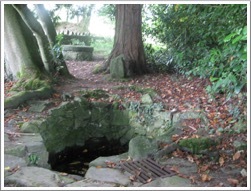 Across the stream that bisects the site and some distance away are St. Peacaun’s Well and Peacaun’s Cell (presumed to have been a small beehive hut). See the photos left and right. 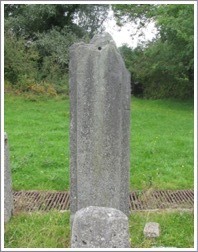 To the west of the church, on higher ground is an undecorated stone shaft that is presumed to be the shaft of a cross. It is referred to as the West Cross. See the photo to the left. Southeast of the church there is a rectangular area where numerous stones have been placed. 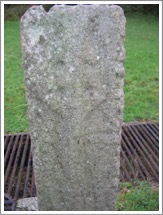 These include parts of the East Cross, two cross inscribed stones and remains of grave slabs. See the photo above right and those to the left and right. 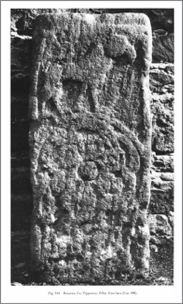 The source of the photographs of the cross inscribed stones is the Early Christian Ireland website cited below. 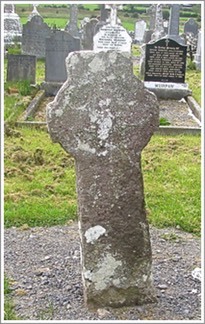 As indicated above, there are four crosses or, more accurately, fragments of crosses present at Toureen Peakaun. 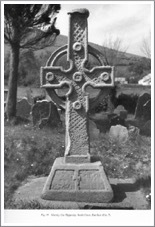 Harbison lists only one, the East Cross, as fitting his criteria for Irish High Crosses. This suggests that the other three, the West Cross and the two plain crosses attached to the walls of the church are of a date later than 1200. I will be describing each of the four crosses, beginning with the East Cross. Both the shaft and the arm share the feature of a reveal. 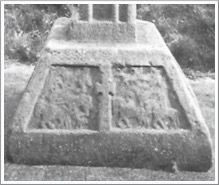 This appears on each face of the cross as seen in the photos below. 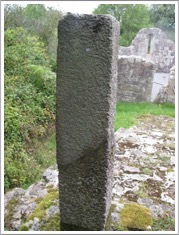 In the photo to the left the tall stone is part of the shaft of the cross. In the foreground and just to the right is a stone that is one of the arms of the cross. 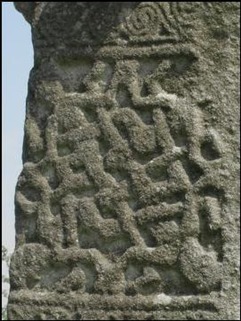 Lower on the shaft is another incised cross and above it “a six-line inscription in a mixture of capitals and half uncials. This mixture of scripts led Duignan to “suggest an early date ‘before the half uncial had been established as the Irish norm for inscriptions as well as for manuscripts.’” (Waddell and Holland, p. 179) The inscription has yet to be deciphered. 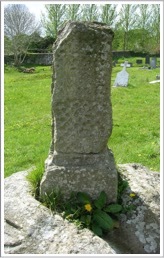 The West Cross:This is not listed by Harbison as a pre twelfth century cross. This was confirmed by Crawford, who in 1909, stated that it was uncarved and not of an early type. The cross is composed of two fragments that stand on a platform above the church to the west. Duigan noted some “very faint lines on the pitted West face of this shaft are a very uncertain cross pattern.” (Waddell and Holland, p. 179) Both faces are pictured below. 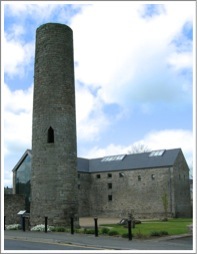 Getting : The site is located between Cahir and Tipperary. From the N24, take the L3102 to the southwest. About half a kilometer along the L3102 take an unnamed road to the south. Within a couple of hundred feet you will cross a railroad track, drive through a farm yard and continue down a narrow lane that runs along a small stream. The cross is on the right near the ruined church. 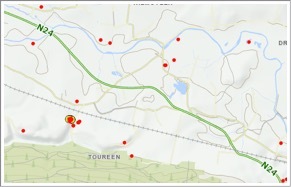 The site is indicated by the yellow circle in the lower left corner of the map below. In the search select Tipperary South and search for Cross. 12/10/2015. Buckley, Michael J. C., “Notes on Boundary Crosses”, The Journal of the royal Society of Antiquaries of Ireland, Fifth Series, Vol. 10, No. 3, September 30, 1900, pp. 247-252. Edwards, Nancy, “An Early Group of Crosses from the Kingdom of Ossory”, The Journal of the Royal Society of Antiquaries of Ireland, Vol. 113 (1983), pp. 5-46. Henry, Francoise; Irish High Crosses, Three Candles LTD., Dublin, 1964. 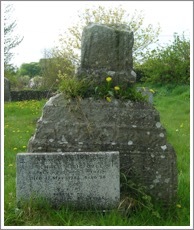 MacNamara, George, U., “The Ancient stone Crosses of Ui-Fearmaic, County Clare: Part I", The Journal of the Royal Society of Antiquaries of Ireland, Fifth Series, Vol. 9, No. 3, September 30, 1899, pp. 244-255. Meehan,Cary, Sacred Ireland,Gothic Image Publications, Somerset, England, 2004. Morgan, A. P., Ballynilard Cross, The Journal of the royal Society of Antiquaries of Ireland, Fifth Series, Vol. 9, No. 4 (Dec. 31, 1899), p. 430. 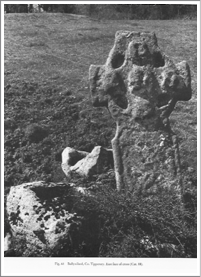 O’Farrell, Fergus, “Dysert O’Dea: The Monks of Dysert O’Dea”, Archaeology Ireland, Vol. 18, No. 3 (Autumn, 2004), pp. 26-27.